1Kidney Transplant Center, Medical City, Baghdad, Iraq. 2Department of Biochemistry, Al-Nahrain University, Baghdad, Iraq. 3Pediatric Department College of Medicine, Al-Nahrain University, Baghdad, Iraq. Pediatric Department College of Medicine, Al-Nahrain University, Baghdad, Iraq. Ali RJ, Al-Obaidi FH, Arif HS.The Role of Urinary N-acetyl Beta-D-glucosaminidase in Children with Urological Problems. Oman Med J 2014 May; 29(4):285-288. Objectives: To assess urinary NAG/ urinary creatinine (NAG/ Cr) ratio in patients with urological abnormalities (normal and abnormal ultrasonography) and compare it with normal healthy children. Methods: A prospective study was conducted from November 2012 to April 2013. Urine samples were collected from 70 patients with various urological abnormalities, and from 40 healthy control groups, their age range (1 month-13 years). Children who were admitted to Emergency Pediatric department, Children Welfare Teaching Hospital / Medical City Complex, Baghdad, Iraq. The Glomerular filtration rate was in normal range in all of them. Urine samples were tested for NAG by (ELISA, Cusabio, China) while, both Serum creatinine (S-Cr) and urine creatinine (U-Cr) were estimated by Jaffe’s kinetic method. Results: In this study 29% of the patients had normal ultrasonography and 72% abnormal ultrasonography. 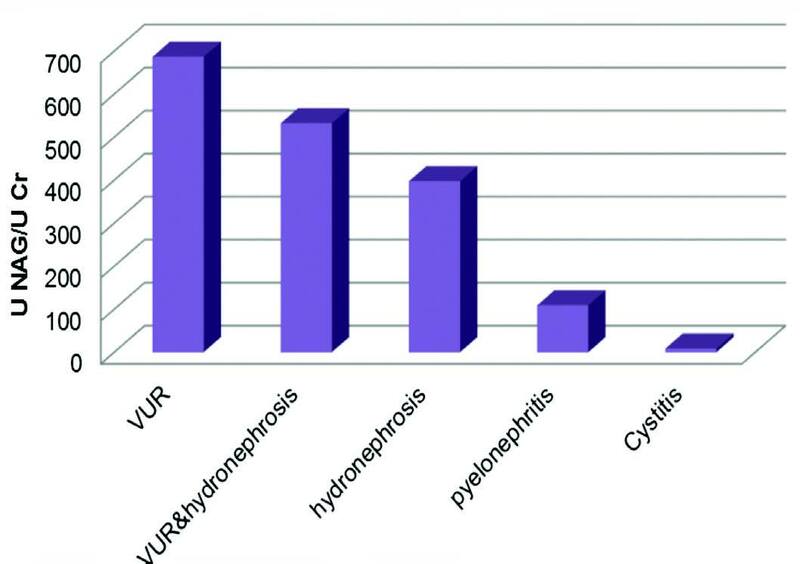 The current results revealed that NAG/creatinine index was significantly higher in all patients with (vesicoureteral reflux, hydronephrosis and pyelonephritis) in comparison with cystitis. Conclusion: The assessment of urinary NAG could be considered as a useful marker in prediction of the (vesicoureteral reflux, hydronephrosis) .Urinary NAG is elevated in children with pyelonephritis and it can be considered as a further criterion in the diagnosis of upper urinary tract infection. Keywords: Urinary N-acetyl-beta-D-glucosaminidase; urinary tract infection; vesicouretric reflux; hydronephrosis. This study was done by the approval of biochemistry committee of Al-Nahrain University Medical College in partial Fulfillment of the requirements for the degree of Master of Science in Clinical Biochemistry. Control (1) group (n=11) - Less than 24 months (< 2 years). Control (2) group (n=13) - Preschool age 24-60 months (2-5 years). Control (3) group (n=16) - School age above 60 months (> 5 years). Urine and blood specimen were obtained from both patients and control group. A fresh random urine sample, collected at the first morning void was obtained on the admission time, all urine samples were analyzed by urinary dipstick and centrifuged to remove cellular components, the supernatants were stored at -20°C these urine samples were tested for N-acetyl-beta-D-glucosaminidase (NAG) (ELISA Kit Catalog No.CSB-E09450h .CUSABIO, China) .Both S-Cr and U-Cr were estimated by Jaffe’s kinetic method (Randox Laboratories, England). The urinary NAG values were expressed as the urinary NAG/creatinine ratio. All of our patients were treated with same medication. The statistical analysis done by using social sciences software (SPSS version 17) Microsoft excel 2010 data were presented as mean ± SD for continuous data and percentage for categorical variables between every two groups were performed by student's t-test, while comparisons among groups were carried out by one-way analysis of variance (ANOVA). For all tests p-value <0.050 was considered statistically significant and <0.001 was considered highly significant. The receiver operating characteristic curve is used to define the diagnostic value (specificity and sensitivity) and best cutoff value of urinary NAG index. In this study, 70 patients were evaluated; 41 girls (59%) and 29 boys (41%). Their age range was within 1 month to 13 years with a mean age of 51.68 ± 40.76 months. While the apparently healthy control group in this study was 40 subjects, 23 girls (58%) and 17 boys (43%); their age ranged between 1 month-13 years with mean age 58.29 ± 42.13 months; 29% of the patients had normal ultrasonography and 72% abnormal ultrasonography. The current results revealed that the mean NAG/creatinine index was significantly higher in all patients than healthy control group at (p<0.001), histogram1 and table (1) shows the mean urinary NAG/creatinine index of all patients group, the highest mean level was observed among patients with Vesicoureteral Reflux (grade II, III, IV) (687.47 ± 176.1 U/g), while in hydronephrosis and pyelonephritis the mean levels were (398.18 ± 166.77 U/g) and (109.83 ± 37.81U/g) respectively then the level drop to normal in patients with cystitis (9.1 ± 4.4 U/g) at p value <0.001, and hence it demonstrates the differences between upper and lower UTI and the differences between normal and abnormal ultrasonography for selected diseases. Figure 1: Comparison U NAG/U Cr among patients groups. Table 1: Comparison between all patients groups by ANOVA. BW =body weight, WBC=white blood cell count, U. NAG = Urinary N acetyl Beta - D glucosaminidase expressed in unit per liter (U/l), S =serum, U = urine,*= p value significant result, **= p value highly significant result, ANOVA=Analysis of variance. Table 2: Comparison between three control age groups by ANOVA test. Control 1= (age ≤ 24 m) group, control 2= (age > 24 m and ≤ 60m) group and control 3= (age > 60 m), BW =body weight, WBC=white blood cell count, U. NAG = Urinary N acetyl Beta - Dglucosaminidase expressed in unit per liter (U/l), S =serum, U = urine, SD = Standard deviation, *= p value significant result, **= p value highly significant result, ANOVA=Analysis of variance. Table 3: Sensitivity and specificity of urine NAG/urine creatinine ratio in all patients groups except cystitis. Table 4: Positive and negative predictive value of urine NAG/urine creatinine ratio. Figure 2: Receiver Operating Characteristic curve showing the diagnostic accuracy of Urinary NAG index (blue line). By doing ANOVA test to compare the effect of age on NAG index, the results showed that the highest NAG index was in youngest age group [control (I), 67.16 ± 41.34U/g; control (2), 13.76 ± 5.96 U/g; control (3), 7.42 ± 3.12U/g at p<0.001] as shown in table 2. The assessment of urinary NAG could be considered as a useful marker in prediction of the VUR, hydronephrosis and renal tubular impairment in various disease states. Urinary NAG is elevated in children with pyelonephritis and it can be considered as a further criterion in the diagnosis of upper urinary tract infection. 1. Chiu JS. Models used to assess renal function. Drug Dev Res 1994;32:247-255. 2. Mohkam M, Karimi A, Habibian S, Sharifian M. Urinary N-acetyl-beta-D-glucosaminidase as a diagnostic marker of acute pyelonephritis in children. Iran J Kidney Dis 2008 Jan;2(1):24-28. 3. Schwab CW Jr, Wu HY, Selman H, Smith GH, Snyder HM III, Canning DA. Spontaneous resolution of vesicoureteral reflux: a 15-year perspective. J Urol 2002 Dec;168(6):2594-2599. 4. Hellerstien S. Recurent urinary tract infections in children. Pediatr Infect Dis J 1982;1:271-281 . 5. Middleton AW jr.NixonGW.the lack of correlation between upper tract changes on excretory urography and vesicouretral reflex .j urol .1980; 123:227-228). 6. Seppänen U, Torniainen P, Kiviniitty K. Radiation gonad doses received by children in intravenous urography and micturition cysto-urethrography. Pediatr Radiol 1979 Jul;8(3):169-172. 7. Sidhu G, Beyene J, Rosenblum ND. Outcome of isolated antenatal hydronephrosis: a systematic review and meta-analysis. Pediatr Nephrol 2006 Feb;21(2):218-224. 8. Skalova S, Rejtar P, Kutilek S. Increased urinary N-acetyl-beta-D-glucosaminidase activity in children with hydronephrosis. Int Braz J Urol 2007 Jan-Feb;33(1):80-83, discussion 84-86. 9. Skálová S. The diagnostic role of urinary N-acetyl-beta-D-glucosaminidase (NAG) activity in the detection of renal tubular impairment. Acta Medica (Hradec Kralove) 2005;48(2):75-80. 10. Csáthy L, Oláh AV, Pócsi I, Varga J, Balla G, Price RG. [Age-dependent urinary N-acetyl-beta-D-glucosaminidase activity in healthy children]. Orv Hetil 1994 Jun;135(24):1301-1303. 11. Jack S. Elder. Urological disorders in infants and children. In: In: Nelson Textbook of Pediatrics, 19th ed. Robert M. Kliegman Bonita F. Stanston, Nina F Schor, Joseph W Geme, Richard E Behrman ed. Elsevier Saunders, Philadelphia 2011: p 1843. 12. Skalova.S and Chladek J. Urinary N-acetyl-b-D-glucosaminidase activity in healthy children, Nephro. j Hradec Králové, 2004 ;9,19-21 . 13. Lesley A. Stevens, Shani Shastri, Andrew S. Levey. Assessment of renal function. In: Jürgen Floege, Richard J. Johnson, John Feehally ed. Comprehensive clinical nephrology,4th ed. St.louis Elsevier Saunders. 2010: p 31-33. 14. Schwartz GJ, Brion LP, Spitzer A. The use of plasma creatinine concentration for estimating glomerular filtration rate in infants, children, and adolescents. Pediatr Clin North Am 1987 Jun;34(3):571-590. 15. Lisowska-Myjak B. Serum and urinary biomarkers of acute kidney injury. Blood Purif 2010;29(4):357-365. 16. Fanos V, Mussap M, Osio D, Pizzini C, Plebani M. Urinary excretion of N-acetyl- beta-D-glucosaminidase and epidermal gfrowth factor in paediatric patients receiving cefixime prophylaxis for recurrent urinary tract infections. Clin Drug Investig 2001;21:511-518 . 17. Lee RS. Biomarkers for pediatric urological disease. Curr Opin Urol 2009 Jul;19(4):397-401. 18. Shokeir AA. 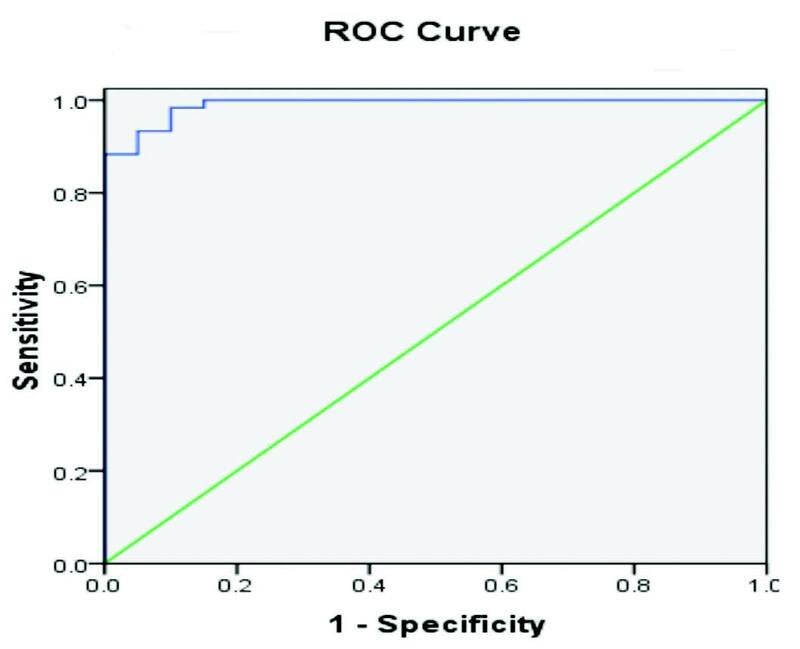 Role of urinary biomarkers in the diagnosis of congenital upper urinary tract obstruction. Indian J Urol 2008 Jul;24(3):313-319. 19. Mohkam M, Karimi A, Sharifian M, Dalirani R, Habibian S, Jadali F. Is urinary N-acetyl-beta-D-glucosaminidase a marker of urological abnormality in children? MJIRI 2009;23:36-41. 20. Huang H, Chen J, Chen C. Circulating adhesion molecules and neutral endopeptidase enzymuria in patients with urolithiasis and hydronephrosis. Urology 2000 Jun;55(6):961-965. 21. Skinner AM, Addison GM, Price DA. Changes in the urinary excretion of creatinine, albumin and N-acetyl-beta-D-glucosaminidase with increasing age and maturity in healthy schoolchildren. Eur J Pediatr 1996 Jul;155(7):596-602.